a low-key setting, while helping AHS & AMS sports teams in the process? Come on down to Memorial Park on October 7th for the Albany Community Triathlon! The Albany Community Triathlon emphasizes fitness and fun with a 400m swim, 10k cycle and 3k run. Registration is available at www.albanytri.com. Registrants will get a t-shirt and other swag while supplies last! All proceeds will go to the Albany Athletic Boosters to benefit all High School & Middle School teams. In addition to the fund raising, this event focuses on fitness and fun. If you have always wanted to participate in a triathlon, but felt intimidated at the prospect, this is the one for you. swim and the run! 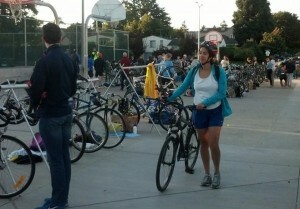 It was fun rooting for my teammate during the swim, riding my bike, then rooting for my other teammate while she ran! Feel great when you cross that Finish Line! Again for 2018 – YOUTH DISCOUNTS for anyone under 18! There is still a FAMILY & FRIENDS HEAT! Parents, kids, spouses: When you register, you can indicate your desire to be in the same wave as one or more family members or friends. Then you can compete together & keep an eye on each other during the race (but not assist each other, per triathlon rules). POST-RACE FESTIVITIES – Stick around after the race to recover with some healthy food, finisher awards, raffle prizes, massages, and schmoozing with fellow participants, volunteers, sponsors, and race organizers. AS&R and Check for Bikes are excited to again be sponsoring the Albany Tri – supplying bike racks for the transition area and swag for the goodie bags. Other sponsors include Club Mallard, Albany Community Foundation, Albany Lions Club, RoadRunner Sports, Mechanics Bank, Blue Heron Bikes, Waterside Workshops and TranSports. So come on down and get in on the fun! 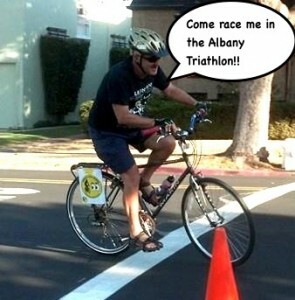 For more information about the Albany Triathlon and please see the web site, www.albanytri.com. This is a great community event and really fun to watch even if you don’t want to participate! Come on down, have fun and support Albany Middle & High School sports! !